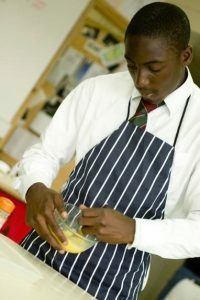 Our Chefs Back to School programme was piloted with Westminster Kingsway College and University of West London in 2018. Student chefs returned to their original secondary school. They provided a practical demonstration to an examination class and described their own course and future career prospects to pupils at the school. Utilise estimated 20,000 (17-19-year-old) hospitality and catering students to go back to 1,000 secondary schools and reach at least 25,000 pupils by 2022, starting with 200 schools in 2018-19. On their visit, student chefs will meet pupils, teaching staff and headteachers, increasing the visibility of this valuable subject, creating a talking point and photo opportunity in school of a successful ex-student. Upskill the student chefs to confidently demonstrate their culinary skills in order to enthuse other young people about Hospitality & Catering courses, and the benefits of a career within the food industry. Post school visit, student chefs will be able to reflect on how much they have learned on their course which will boost their self-esteem, as well as improve their planning and presentation skills. Forge a sustainable, long term partnership between local schools and colleges to increase recruitment to local catering and hospitality courses and provide support between them. 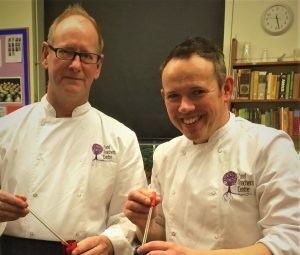 We have chosen student chefs rather than tutors to visit schools. Our research shows that it is increasingly difficult for tutors to find the time within their busy schedules to carry out meaningful outreach work. Using student chefs is a more sustainable model, it is easily scalable nationwide and school pupils will be able to identify with student chefs who are closer to their own age group. Our team has led similar highly successful programmes in the past. We learned that students returning to school transformed pupil aspirations, particularly those in households that had never been to college or university (such as families of three generations unemployed). A recent on-line survey of food teachers supported OFSTED findings (2016 Enterprise Education) that out of 40 schools only 4 were providing careers advice. They describe that since government-funded careers services ended in 2012, that careers advice has not been kept up. 85% food teachers said careers advice had reduced significantly. Teachers also stated that they struggle to find time and up to date information to promote Hospitality and Catering careers, even though they knew it was important for the future of the subject and to get good ‘option’ take up for GCSE/Level 2. All of the teachers said that they would value support when presenting to pupils or parents and would like better links with local course providers or apprenticeships. Our meetings with Hospitality and Catering colleges found that they are all concerned about recruitment for courses and the time it takes to build and sustain relationships with local schools. 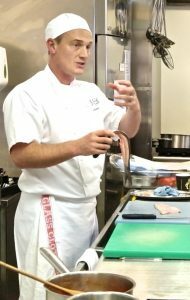 Whilst they run Junior Chefs Academies, Taster and Open days, their outreach work has become limited to visiting just a few schools due to staff time shortage. In the pilot, they responded that using students chefs is a more sustainable model, as they can reach a significant number of schools more quickly and thus have greater impact on recruitment. Join our programme! This project is part funded and supported by the Savoy Educational Trust. The team are donating 50% costs. We are keen to partner with others to extend the reach of the project by 2022. Please contact us if you would like to become a funding partner.